Owner reported cruise and fuel consumption: usual cruise at approximately 6.5 - 7.5 knots, 2 - 2.5gph. *Pro Mariner True Power Combi 2500w Charger/inverter. *Solar panel: Kyocera 135 w/ control panel. *Bottom inspection, gear cleaning and new zincs. *Oil and Fuel: fluid & filters changed. *Raw water pump impeller changed. LOA for moorage: 33' (Currently moored in a 32' covered slip - lease transferrable). Fuel tanks: Aluminum; main tank 120 gals. Aux tank: 30 gals. Stepping aboard from the starboard side, you notice the inflatable dinghy attached via a davit system and you have easy access to the large cockpit through a transom door. A sink, storage cabinet and trash receptacle are cleverly built in. Molded steps lead to both starboard and port side decks for deploying fenders, checking the solar panel topside, or transiting to the foredeck. A custom canvas bimini/sunshade extends over the cockpit providing shade and protection from inclement weather. Entering the main cabin, I am impressed with the condition of the boat throughout. The teak, upholstery, windows and all of the coverings appear to be in excellent condition. The “ergonomically designed” galley is complete with a Princess two-burner Gourmet II propane stove and oven, side-by-side stainless sink, Nova Kool fridge with small freezer compartment, solid surface counter top and a good amount of storage and drawer space. To port is the second sleeping compartment area with a double berth. There are privacy hatches for guests. On this boat, the 65 qt. Nova Kool cooler/freezer finds its home in this area along with extra pads to convert the dinette into a sleeping berth and storage space for additional lifejackets. Forward on the port side is the facing settee and table with storage below. The Dometic wine cooler is under the settee, just across from the fridge. The forward port companion seat is hinged to allow a passenger or two to face forward while underway or face aft for seating at the dinette. To starboard is the helm with Garmin navigation and autopilot package as well as bow and stern thruster controls and comfortable captains’ chair. A pilothouse sliding door allows quick and easy access to the side and foredeck. The upholstery for the dinette and captain's chair match and is an attractive Ultrahide fabric in excellent condition. The roomy master stateroom is forward: with an offset “nearly walk around”-style double berth, custom shelves, TV and storage locker and drawers, this area offers a comfortable space and plenty of storage options for longer cruises. The enclosed private head has an electric, Tecma fresh water toilet, shower wand, solid surface counters and storage. Lighting throughout the boat is LED; the solar panel topsides provides ample battery charging to keep you comfortable while at anchor. Inflatable dinghy: 8’; smaller than usual for an R-29. Stock for R-27 direct from Ranger Tugs. Bow and Stern thrusters w/ remote. If wishing to trailer: total height on a trailer is 13'2". Quoted displacement is dry -- typically trailerable weight is about 13,000 lbs. for the boat (with gear aboard and 1/2 load of fuel) and about 2200 lbs. for the trailer. NOTE: this vessel is not equipped with a trailer. Navigation pkg: Garmin 5215 (4kw radar dome, GPS Antenna, depth & Fishfinder). VIRTUAL TOUR - VIDEO - 80 TO 100 PHOTOS - FULL SPECS CAN BE VIEWED OF THIS 2012 RANGER TUG 29! The Ranger Tugs line revolutionized the trawler market by developing “pocket trawlers” that are trailerable yet offer large-boat features and comfort for extended cruising. These boats appeal to a large range of people: those new to boating; those who are very experienced and either want to move up or down in size or converting to power boating after sailing for many years. 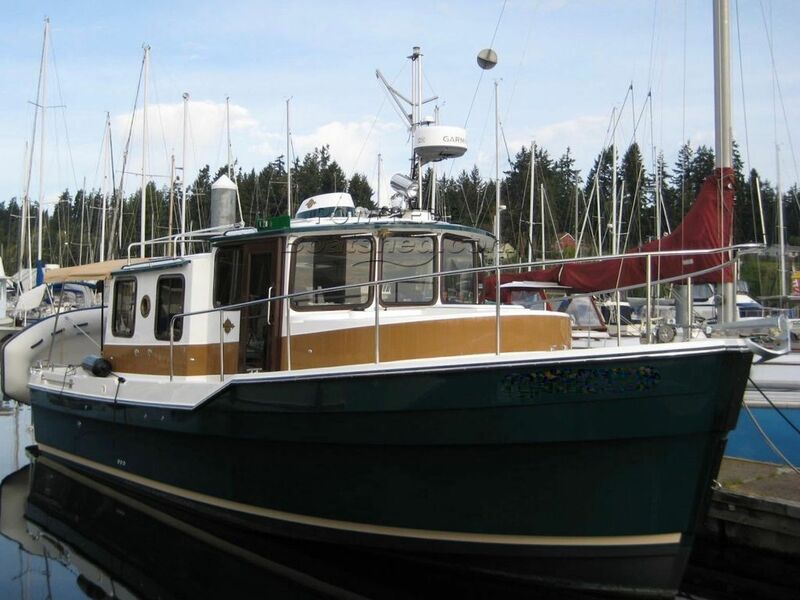 Waterline Boats / Boatshed Everett is fortunate to offer this excellent example of a Ranger Tugs R-29 with its unbelievably complete equipment list and in superb condition. This compact boat is attractive inside and out! You'll find a very large cockpit with bimini cover and molded steps to the side decks. There is exceptional all-round visibility from the helm, a bright and airy interior, a roomy master stateroom, a large head/shower compartment, a private guest stateroom, and a solar panel topside to comfortably enjoy time at anchor. Plus she's easy to dock with bow and stern thrusters and will get up and go with its semi-displacement hull and 260 hp Yanmar diesel! This Ranger Tugs R-29 has been personally photographed and viewed by Gretchen Miles of Boatshed Everett. Click here for contact details.